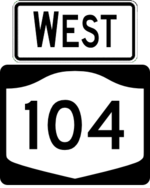 NY 104, former US 104 and NY 126, starts in Niagara Falls and extends past I-81. The freeway in Rochester serves as a bypass of Ridge Road east of the Genesee River and a connector to Webster. The portion west of NY 590, known as the Keeler Street Expressway, is also a part of Rochester's "Outer Loop". East of Webster, it becomes a divided highway and is a major corridor to Oswego. The last portion of the freeway constructed was between Five Mile Line Road and NY 250, with traffic following the frontage road for many years. 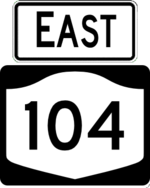 The old alignment followed Ridge Road (which used to connect to the Veterans Memorial Bridge via a traffic circle), Culver Road, and NY 404. In the 2000s, the freeway was extended west from the Veterans Bridge to Ridgeway Ave after the adjacent houses burned down in a fire. Downtown Rochester No access to NY 590 north.